Heat ½ tbsp olive oil in a large frying pan and gently cook ½ leek, thinly sliced, for 2-3 minutes until starting to soften. Add 200g pack Waitrose Frozen Seafood Raw Peeled King Prawns with 250g Scottish Salmon Fillet, skin removed and cut into 2-3cm chunks. Gently cook for a further 5-6 minutes until the prawns are pink and the salmon is opaque. Add 200g half fat crème fraîche and 15g pack chives, snipped. Stir and bring to the boil then allow to bubble gently for about 1 minute. Season with freshly ground black pepper and a little lemon juice. 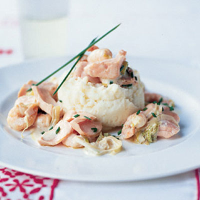 Serve immediately with a pile of creamy mashed potato.